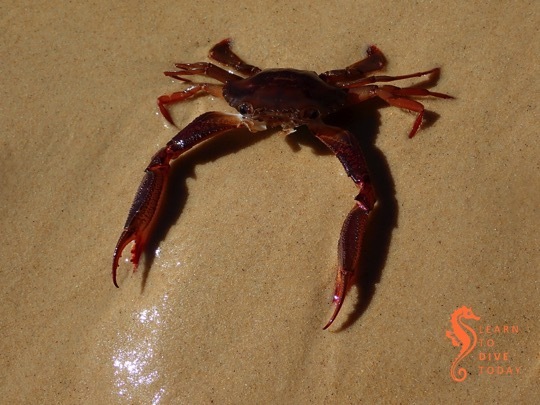 Last week we met Smith’s swimming crab (Charybdis smithii), a rare visitor from the tropics that arrived in the southern reaches of False Bay during the third week of January 2019. 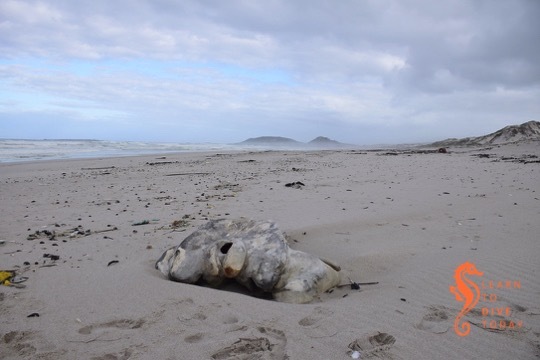 We found some adult individuals at Long Beach, well inside False Bay, on 3 March. 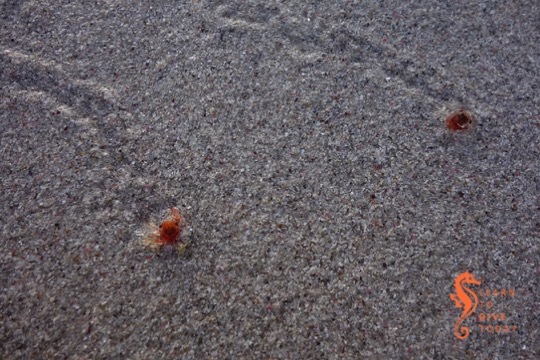 At the same time that fishermen were reporting adult Smith’s swimming crab off Cape Point, a huge number of tiny red crabs washed up on Long Beach, Kommetjie. There were great piles of them, but we only managed to visit a day or two later on Friday 18 January. 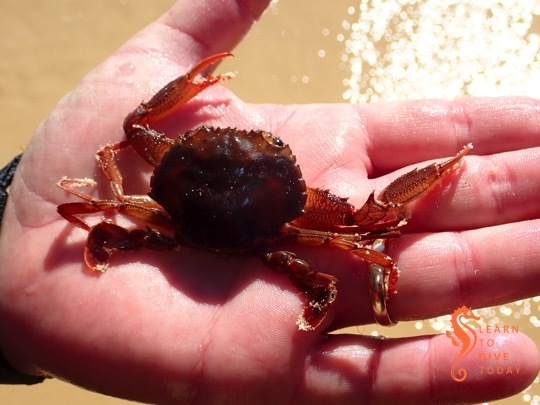 We had to hunt a little, but after a while we found the crabs – now only a few remaining, but most of them very active and vital. 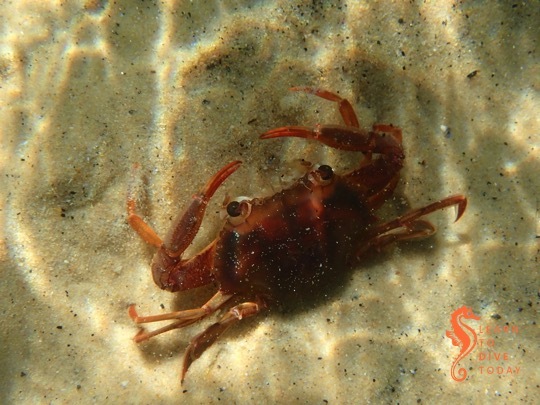 Opinion from George Branch is that these are most likely the final larval stage of Smith’s swimming crab, and the same warm conditions wit anomalous westerlies that brought their adults to the peninsula, brought the juveniles. 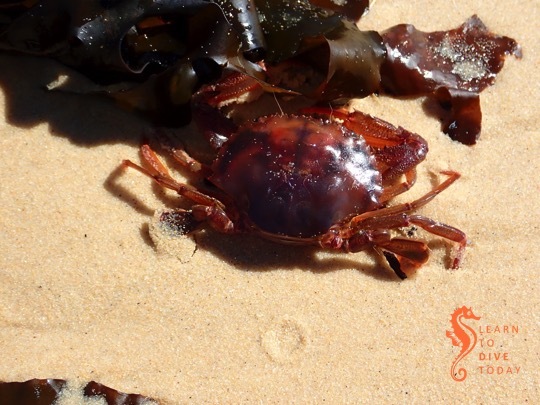 This conversation (facebook group, may be closed) suggests that the juvenile Smith’s swimming crabs were also seen on Milnerton Beach around the same time as they appeared on the beach at Kommetjie. 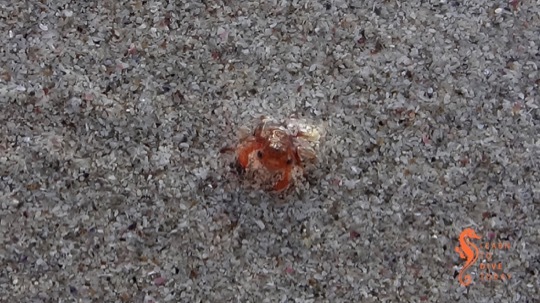 I took a couple of short videos of the tiny crabs, which show them in motion on the wet sand. 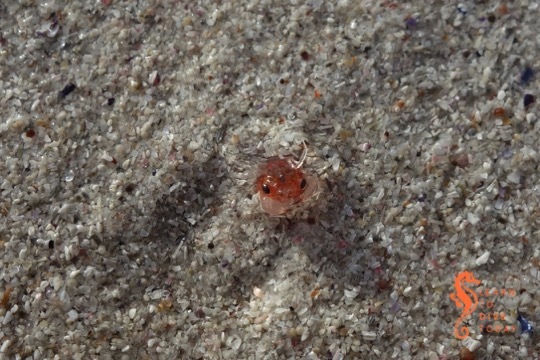 Apologies for the loud wave noise and less than perfectly steady camera work. 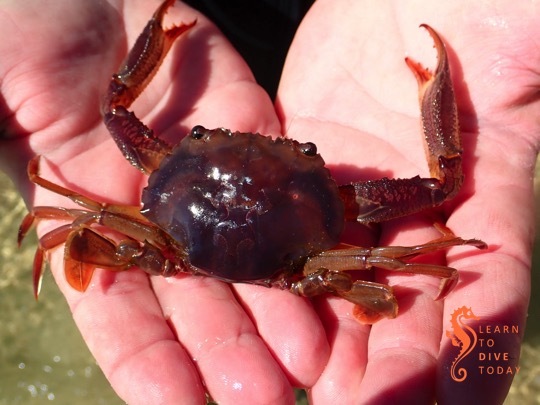 Read more about these pelagic crabs, exceptionally infrequent visitors to our shores, in this post. Weekend conditions don’t look all that great. 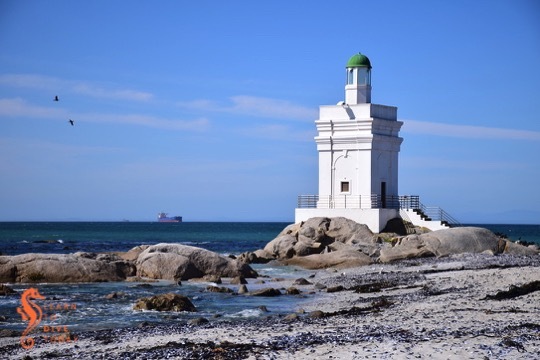 Saturday will most likely be best for launching from Hout Bay , or there may be a slight chance of shore dive from Long Beach for students. I will make this decision late tomorrow depending on sea conditions. 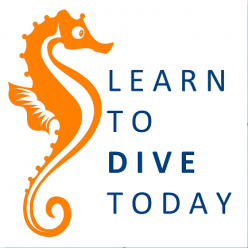 Let me know if you’re keen to dive. 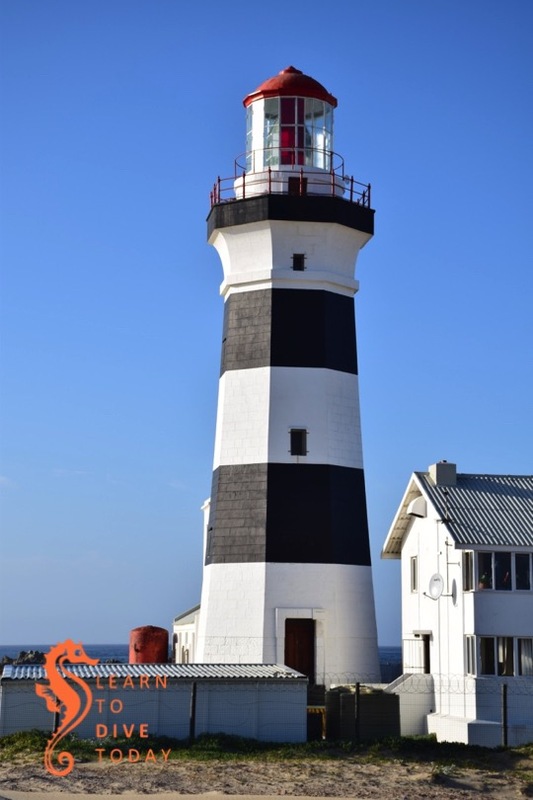 Sunday is the Cape Peninsula marathon, starting in Green Point and finishing in Simon’s Town, so expect some road closures. 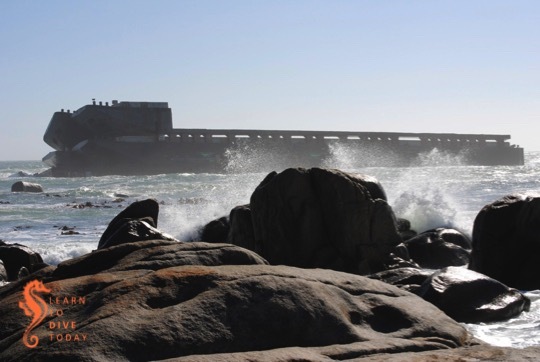 There’s a free screening of the documentary Tidal at St James beach on Thursday 7 March. Read about the film here, and RSVP on Quicket. There’s no charge. No diving This weekend’s wind is forecast to be between 30 and 50 km/h, which, in my book, renders the weekend not suitable for diving. Sorry, kids. 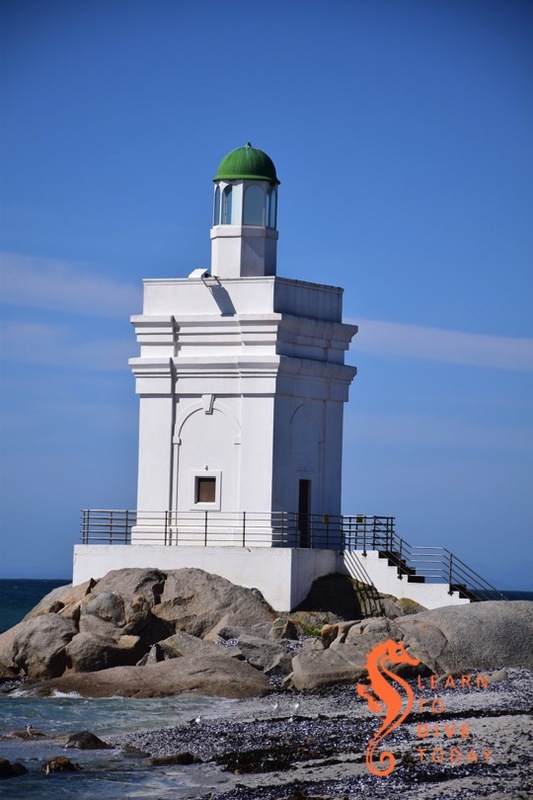 If you feel like a natural exfoliation, the visiting elephant seal is still on Fish Hoek beach, just after the little yellow and white mini lighthouse half way down the beach. He’ll be leaving soonish, so don’t delay. 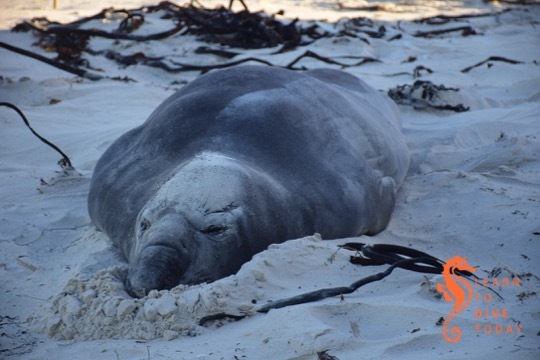 Read more about elephant seals here. 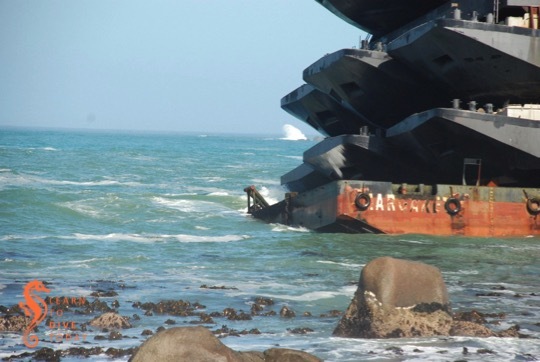 One of the most spectacular shipwrecks I’ve ever seen was that of the 100 metre long unmanned barge Margaret, which ran aground at Jacobsbaai on the West Coast on 24 June 2009. Margaret was carrying two halves of a floating dry dock and twelve river barges (positioned atop each other in side by side pairs, with two rows of three at the bottom). She was under tow by the tug Salvaliant from the Chinese shipyard where everything was manufactured, to Rotterdam. The barges were destined to transport cargo up and down the navigable rivers in Europe. 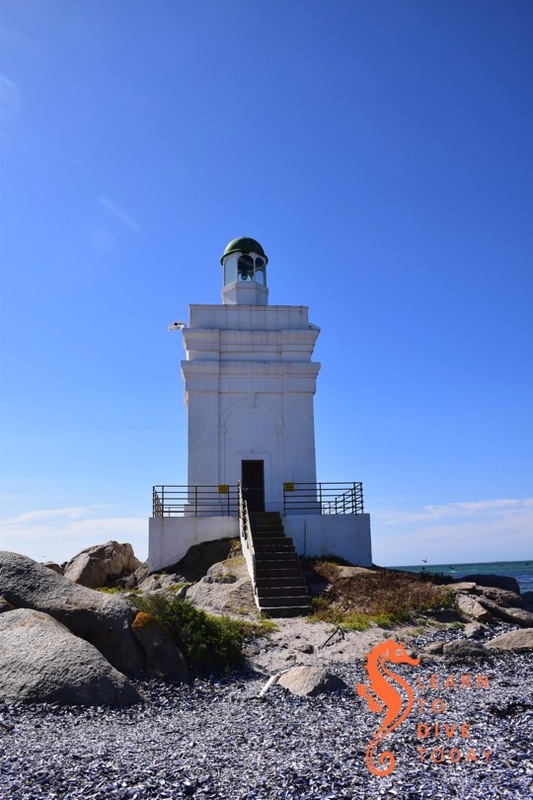 During a winter storm, the tow parted, and Margaret and her cargo ran hard aground on the rocky reef just outside Jacobsbaai. 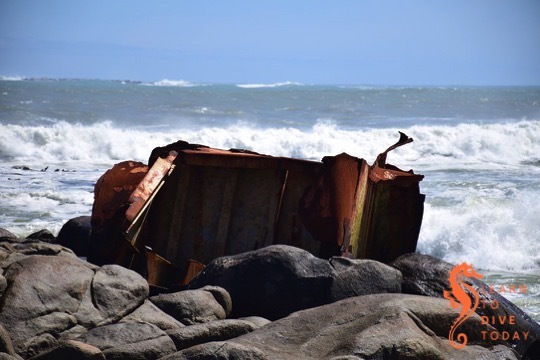 Salvaging the barges proved to be an almost intractable problem, so Margaret was still sitting firmly a couple of hundred metres off the beach when Tony and I visited six months after her grounding, in late December 2009. 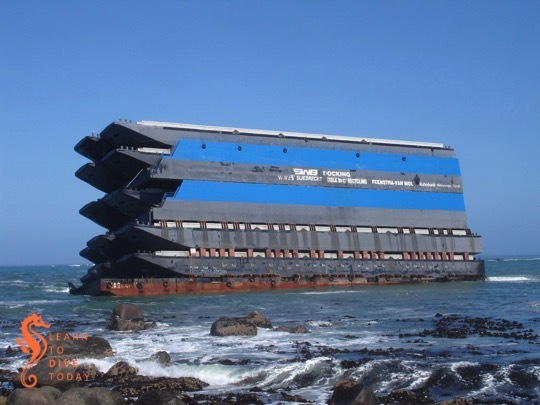 The stack of barges and two halves of a floating dry dock (the blue parts of the structure in the images) was clearly visible from a great distance. 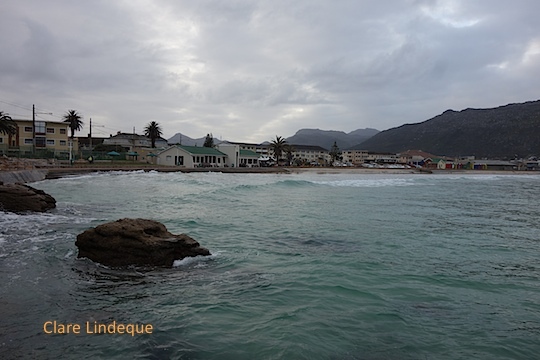 The sight was even more incongruous than that of the Eihatsu Maru aground on Clifton beach, which was a wreck-lover’s dream (but unfortunately not a permanent arrangement). 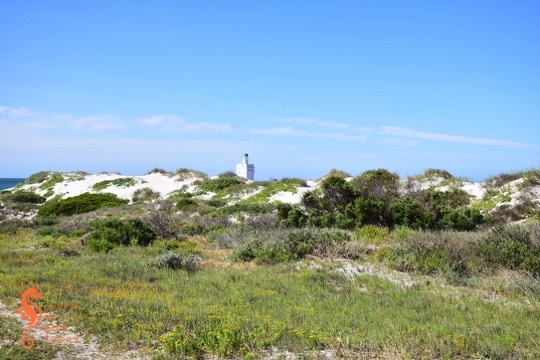 I wish I’d taken a picture of what the wreck looked like as we drove down the hill into Jacobsbaai, but you can see one here if you scroll around a bit. It looked like an office block rising out of the ocean. The wreck was so large that it was visible from almost every point in the sleepy town, and the brain struggled to make sense of the sight. 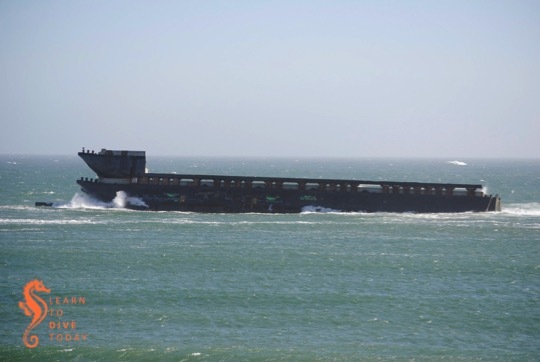 It’s clear from the images what a challenge it must have been to tow the barge in the wind, as the forty to fifty metre high, perfectly flat sides of the stack must have provided tremendous resistance in a gale. 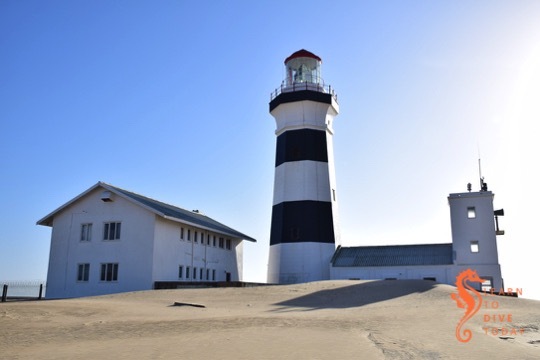 The owner ran out of money to continue salvage in February 2010, and Margaret was becoming increasingly damaged and unstable as time passed. 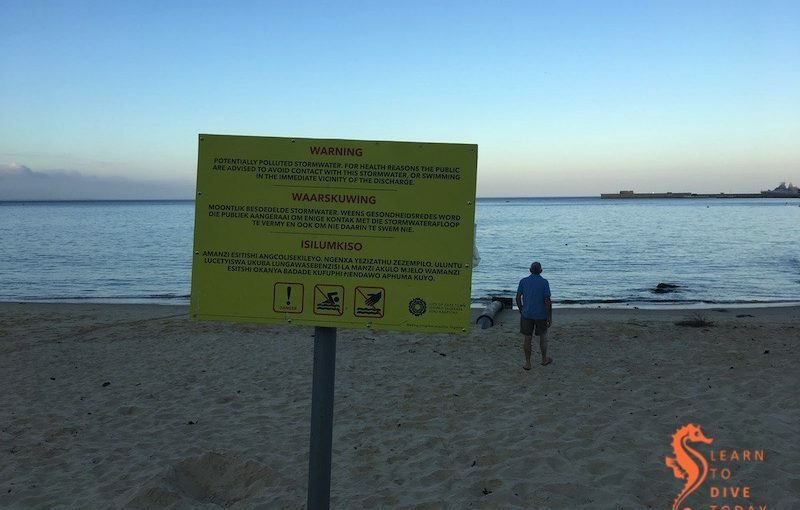 The risk of the upper barges coming loose during another storm, and drifting away to cause a hazard to other ships or coming ashore on the beach, was great. 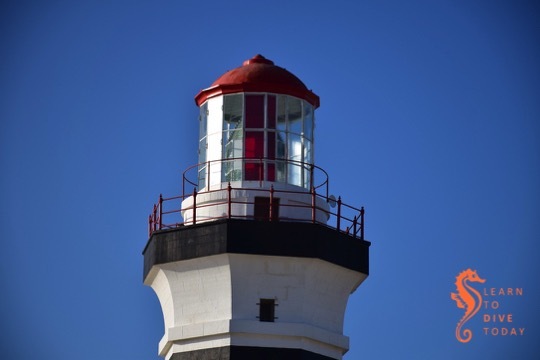 It was decided by SAMSA to persist with an attempt to reduce the wreck, at taxpayers’ expense. 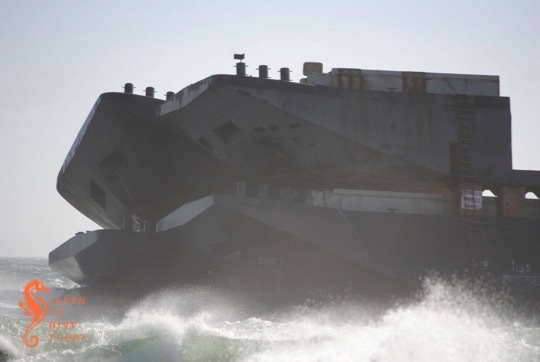 Any money obtained by selling off the salvageable barges would go towards defraying costs. Tony and I visited the wreck again in April 2010, after the demolition that freed six of the topmost barges. The seaward wall of the upper piece of floating dry dock, weighing 91 tonnes, had been cut away to allow the barges to slide off freely. Over two tons of explosives were used in total. Small (125 kilogram) explosive charges were set off one after the other to create a ripple effect that dislodged the top six barges. 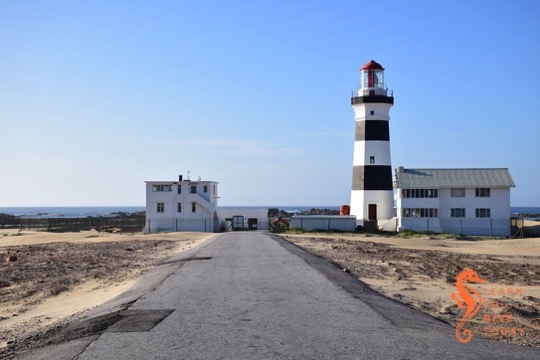 These were towed to Saldanha, and then sold. If you like reading court judgments, here’s one in which the owners of the barges attempt to claim damages (massive ones) from the owners of the tug Salvaliant. 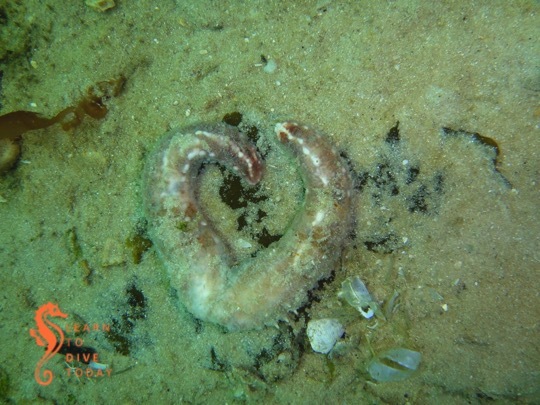 There’s also a great collection of photos of the wreck in her various incarnations here. 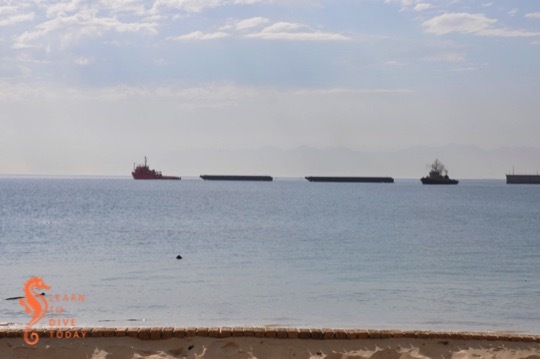 In late April 2012, Tony snapped this lucky shot of two of the barges leaving Simons Town harbour under tow. They’d been moored against the harbour wall for at least a month, to the consternation and fascination of the local paddling community. 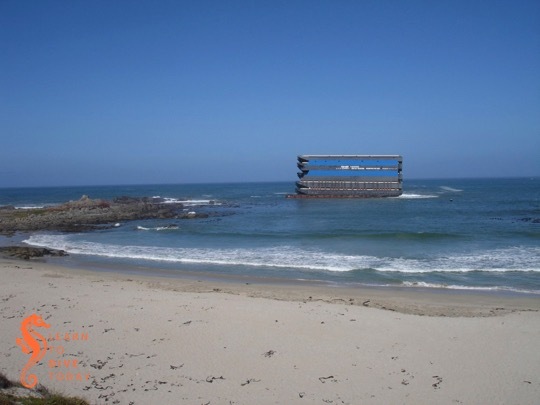 The remains of Margaret and her cargo were further demolished down to sea level and below, and now comprise an artificial reef. Fortunately there was no fuel or other pollutants in the stack of barges, which made the process significantly less polluting than it might otherwise have been. 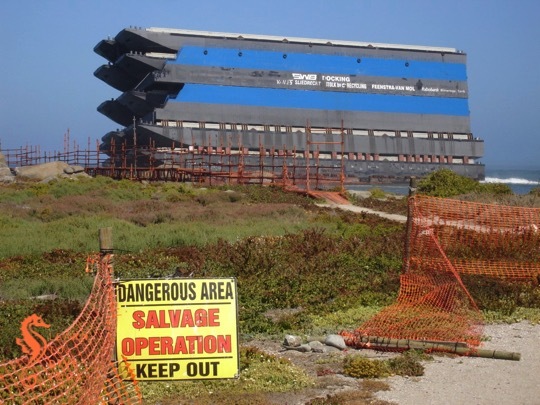 Tony and I visited Jacobsbaai to check out what remains of Margaret and her cargo in September 2018. The path to the wreck, which was formerly blocked off by hazard tape and “salvage in progress” signs, is wide and easily walkable. 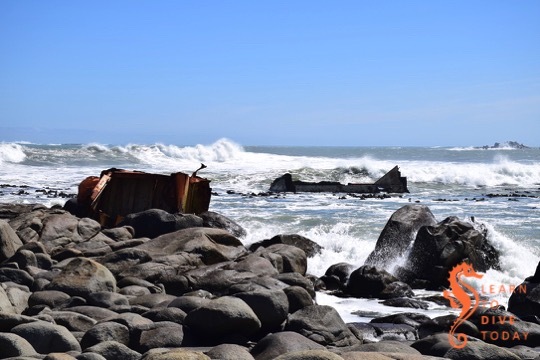 One can go right up to the rocks and view the wreckage from reasonably close up. Watch your foothold here, as it can be slippery and the rocks aren’t all firmly packed. 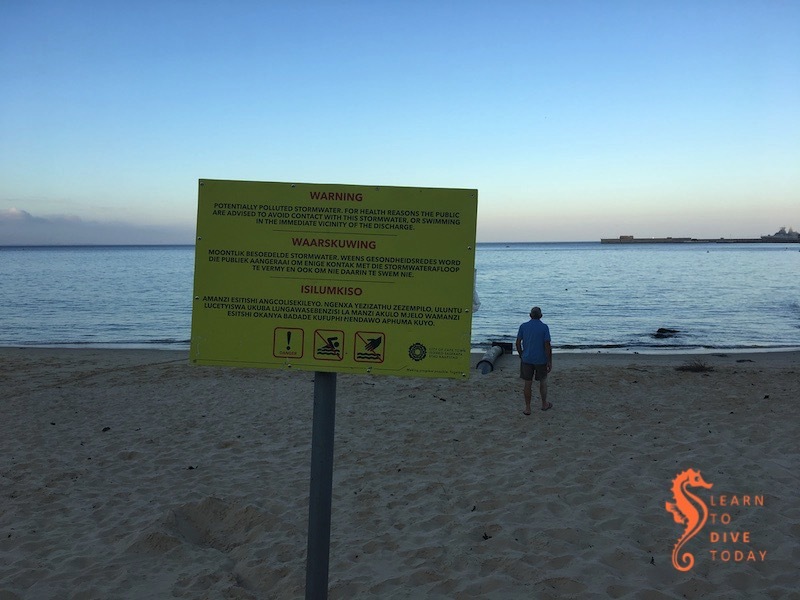 Look out for a small memorial to one of the salvors, who passed away in an accident on the wreck during the course of the salvage operation. 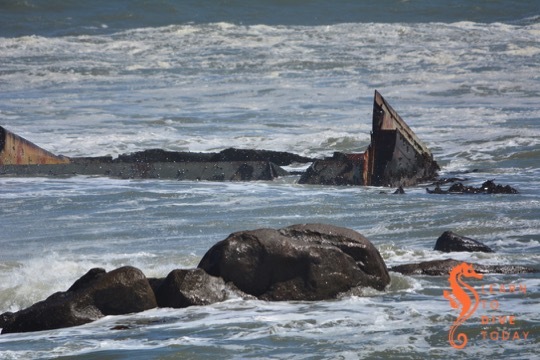 Parts of the wreck look like shark fins in the water, and it is possible that even more of it is visible at low tide. 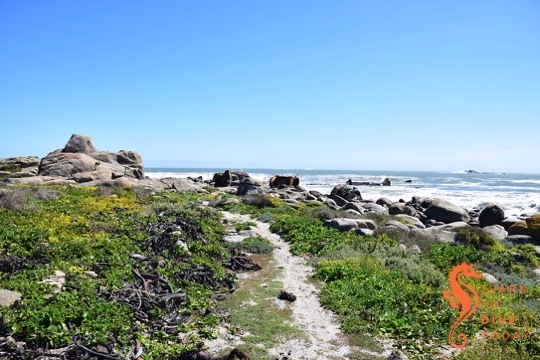 You can find the wreck by turning off the R399 towards Jacobsbaai, and continuing towards the coast until the road becomes gravel. Carry on this road, and when you reach a T junction take a right turn to circle around the tiny, sheltered bay in front of you. 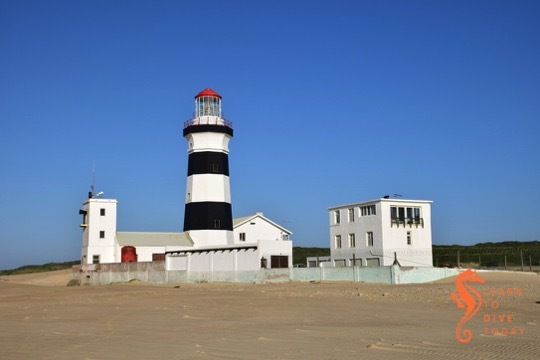 When you can’t drive any more – there will be a small housing development in front of you – park the car and either walk up the steps on the dune to get onto the beach, or, preferably, through the houses. The paved area will give way to a wide gravel path that the salvors used to access the wreck. 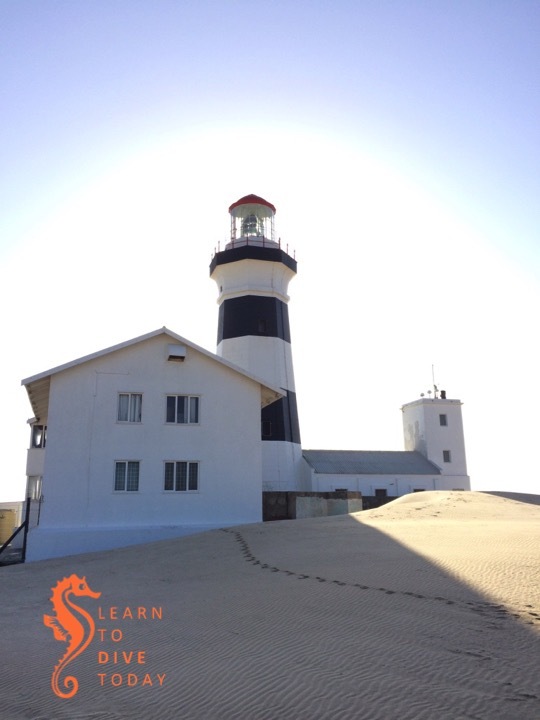 Continue straight along it and you’ll soon spot the wreckage on the rocks ahead and to your right. Co-ordinates are approximately -32.964140, 17.881612. 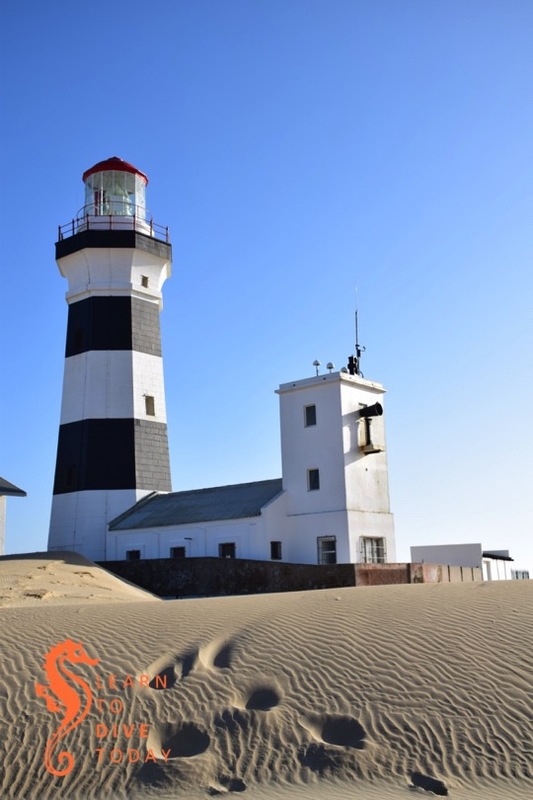 If you’re interested in visible shipwrecks, check out my ebook Cape Town’s Visible Shipwrecks, and this post.